86 My Lady [harlls?] cacke. 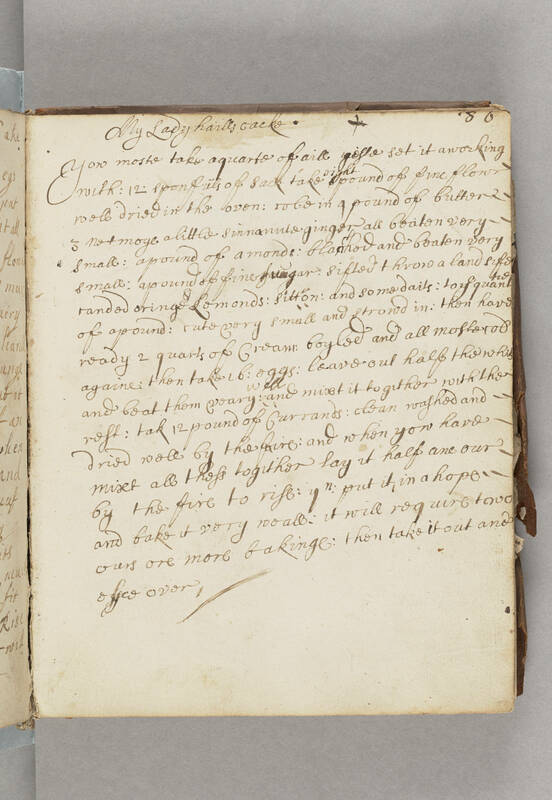 You moste take a quarte of aill yeste set it a working with: 12 sponfuls of sack take eight pound of fine flowr well dried in the oven: robe in 4 pound of butter 2 3 netmoge a little sinnamte ginger all beaten very small: a pound of a monds [i.e. almonds]: blanched and beaten very small: a pound of fine Sugar: sifted throw a [land?] [illegible] oringe & Lemonds: sittron: and some daits: to ye quarter of a pound: [rate?] very small and [strond?] in: then hav ready 2 quarts of Cream: boyled and all [illegible] againe: then take 16: eggs: leave out half the whits and beat them veary well: and mixt it to gether with the rest: tak 12 pound of Currands: clean washed and dried well by the fire: and when you have mixt all these together lay it half ane our by the fire to rise: yn put it in a [hope?] and bake it very weall: it will require two ours ore more bakinge: then take it out and e[illegible] over.